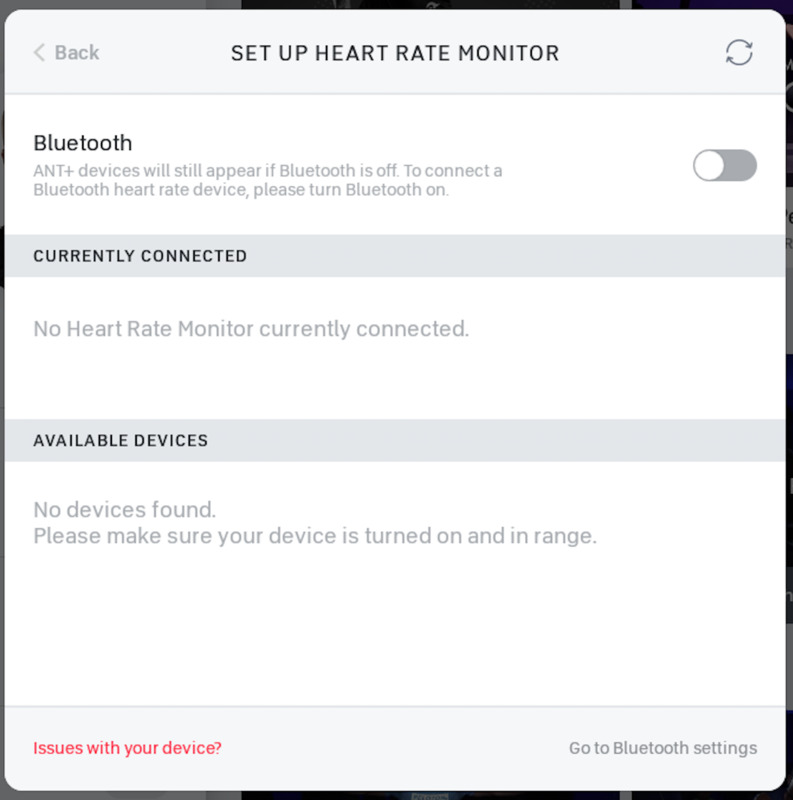 If your heart rate monitor is Bluetooth compatible, you will need to enable Bluetooth on your touchscreen in order to connect them. If Bluetooth is turned off, you will see the screen below. Please ensure the Bluetooth option is turned on before attempting to connect. If your heart rate monitor is not bluetooth compatible, please ensure it is ANT+ compatible as the Peloton touchscreen can also connect with ANT+ compatible heart rate monitors. Prior to attempting these instructions, please confirm you have properly attached and positioned your heart rate monitor, according to the device's instructions. 1. To connect your heart rate monitor, navigate to the Heart Rate Monitor connection modal. You can find the modal by joining a class or by tapping on the time in the top right-hand corner of the touchscreen and selecting 'Heart Rate Monitor'. 2. Select the “Connect” button located next to the desired heart rate monitor. There is no need to connect heart rate monitors in Bluetooth settings. 3. Ensure your heart rate monitor is on for the app to discover the heart rate monitor. If the heart rate monitor is not displaying on the list, tap the refresh button on the top-right of “Set Up Heart Rate Monitor” screen. 4. After connecting the heart rate monitor device, join any class to see the metric for your heart rate in the upper left-hand corner on your screen. If you have any trouble with your heart rate monitor, please you can contact our Support team here.